Are you having unexplained hardware failures – particularly disk drives and power supplies? Are you having unexplained data corruption problems? Do your problems get more frequent or severe after you move equipment or work in the underfloor? Have you installed the latest lightning fast server or CPU only to find it doesn’t seem as reliable as your old legacy system? You may have Zinc Whisker contamination within your data centre. If you are worried contact us we can help . We can sample your Data Room using sticky pads, then have them analysed. This will let you know if you have Zinc Whiskers. 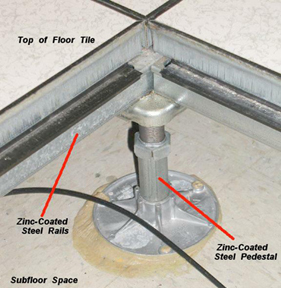 Zinc whiskers are a phenomenon that can occur on the bare metal surfaces of access flooring systems. Affected components include some wood-core and some concrete-core computer room flooring panels as well as some pedestals and stringers. The whiskers grow on the underside (plenum side) of the floor panels or the exposed surfaces of the structural components. 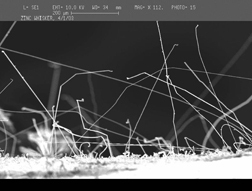 The whiskers are typically 2µm (microns) in diameter and over time, (many years) the whiskers can grow to be several millimeters in length. While the whiskers are attached to the floor panel or pedestal, they are basically benign. When the whiskers break free however, they become airborne and can circulate freely throughout the facility and get blown into your equipment. You should remember that zinc is a metal and a good conductor of electricity. If a whisker comes to rest on an exposed circuit card inside your equipment, it could cause a short; most likely an intermittent short. And as you know, an intermittent problem is the most difficult to detect and fix. Symptoms of Zinc Whisker related failures range from minor data corruption or anomalies to catastrophic hardware failures. A commonly reported problem is a high incidence of power supply failures. You may also experience problems with your tapes and drives. Many victims of zinc whisker problems seem to experience an increase in problems when they migrate to new systems. Zinc Whiskers are so small that the normal dust filters used on computer equipment are ineffective. If you want to stop zinc whiskers from entering your equipment you need HEPA filtration.If you haven’t heard about zinc whiskers before, you may be skeptical - It’s easy to ignore a condition that is under the floor and barely visible at that. But the science behind zinc whiskers isn’t a great mystery, nor is it really new. (Bell Labs reported on metal whiskering in the telecommunications industry back in the 1940s. Telecom and computer companies are still dealing with whiskering from various metal sources today.) Ferrous metals such as steel are normally plated to prevent surface corrosion. Zinc is a very common plating material since it is fairly corrosion resistant, produces a good aesthetic appearance, and is reasonably inexpensive. A normal bi-product of the plating process is high molecular level stresses in the plated metal. The crystalline structure within the metal will attempt to relieve the internal stress by enlarging the structure through the growth of crystals. The growth path is outward and the material is literally pushed out of the surface of the metal. These crystalline growths are known as whiskers. In the case of access flooring, the zinc electro-passivation coating on the steel sheet used to form the bottom pan of certain wood-core and concrete-core panels can have just the right makeup of zinc to promote whiskering of the zinc finish. The same is true for certain pedestals and stringers used to support the floor. Because whiskering happens at the molecular level, the specific molecular make-up of the metal finish can literally prevent or exacerbate the problem. Moreover, the problem is not affected by environmental conditions such as temperature and humidity. If your panels are destined to grow whiskers, they will grow regardless of the environmental conditions.